Meet Gurubari Das (37), a single woman from Tarinipali village in Poirasi Gram Panchayat of Ganjam district, Odisha. Compelled by the circumstances following her husband’s death two years ago, she started working as a daily wage labourer at a local stone quarry to run the household. Despite a meagre earning of Rs. 130 per day, Gurubari would try her best to take care of the expenses of the one person who now meant the world to her, her 7-year-old son! 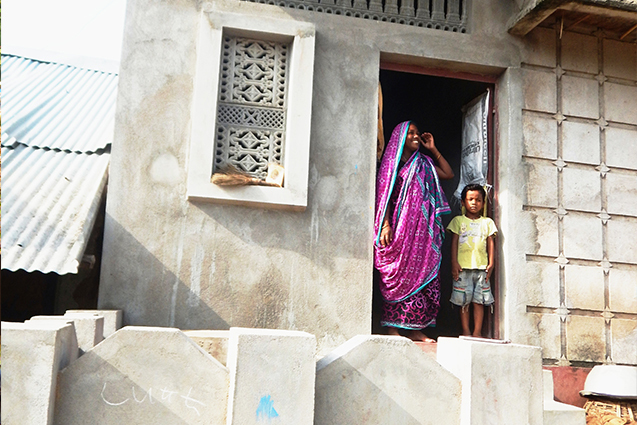 Mother and the son lived in a dilapidated house that had been damaged by Cyclone Phailin. Though most of the families who had lost their houses because of the disaster were awarded a pucca house over a period of time, Gurubari Das wasn’t. And so was the case with 8 more single women households in the village. Gurubari, along with other women, took part in a Disaster Risk Reduction (DRR) Training organized by ActionAid India’s Odisha Regional Office with support from Motorola Solutions Foundation on March 20-21 at Tarinipali. During this training programme, the participants were provided training on disaster preparedness, with a special focus on the needs of women and girls. An orientation on the role of women leaders in disaster preparedness, disaster response and resilience-building was also provided to all trainees. Besides, these women learnt the importance of getting organized and putting in collective efforts to raise their demands. Following the training, women from the 9 deprived households, along with some other women who participated in the training, wrote an application to the local Sarpanch and the Panchayat Extension Officer (PEO), raising their demands for housing. These women, thereafter, decided to visit the Gram Panchayat office to meet them. After the women waited for almost two hours, the PEO announced that while the names of two of the beneficiaries had been approved for the housing scheme (Gurubari Das and Tara Das), the work order was still with the Sarpanch and that it would be sent later to their village. But these women, determined as they were, decided to not leave from the Gram Panchayat office without collecting the work order. Having realized that these women wouldn’t budge, the PEO telephoned the Sarpanch. The Sarpanch immediately had to come to office and hand over the work order to the waiting women. It was then that these women finally left for their village; and both the beneficiaries subsequently started constructing their house. Single women, as we know, live amid multiple vulnerabilities. And while safe housing has a significant role to play in mitigating disaster-related risks in general, its role becomes all the more crucial in the case of single women, that too in disaster-prone states as Odisha. Keeping that in mind, these women didn’t give up. And given their consistent advocacy, the construction of their houses is already complete. Well, what’s more – these houses have the DRR component duly weaved in, thereby enabling these houses to be disaster-resilient! Thanks to this transformed scenario, the beneficiaries are now leading a safe and happy life in their new houses!